Welcome to the End of History! GURPS New Sun combines history with a fantastic future! Based on the award-winning science fiction of Gene Wolfe, New Sun melds fantasy and technology into a unique fusion of swords and lasers, treacherous beauties and starfaring rogues, monsters from history and monsters from outer space, professional torturers and nobles who duel with poisonous plants. 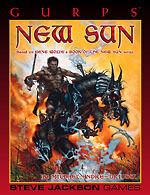 Join the young torturer Severian, naïve servant of the byzantine and shadowy Autarch, as he winds through the crumbling metropolis of Nessus and slowly learns the truth behind his world – or create your own stunning campaign based on the indelible imagery of the Book of the New Sun. GURPS Lensman – The Galactic Patrol is the army and police force of the Civilization that fills two galaxies. Its prime agents are the Lensmen . . . incorruptible, powerfully psionic, ready for anything.